In addition, the fact that revenue collections are ahead of schedule has implications for business tax rates. As part of the budget compromise forged by state lawmakers last September, the rates of both the business profits tax and the business enterprise tax were reduced, effective for tax years on or after December 31, 2016. A second phase of reductions will also take place if FY 2016-2017 General and Education Fund revenues reach a specific target, $4.64 billion. This dollar figure represents a $210 million or 4.7 percent increase from the FY 2014-2015 biennium. Put differently, if revenues rise by 2.4 percent in FY 2016 and by another 2.4 percent in FY 2017, then the target will be hit. Given the most recent data, this scenario is becoming very likely for a few reasons. First, total General and Education Fund revenue is approximately 7 percent higher through the first six months of FY 2016 as compared to the same time period in FY 2015. Second, the economic outlook for New Hampshire, which plays a large part in the performance of state revenues, is likely to remain stable, if not somewhat improve. 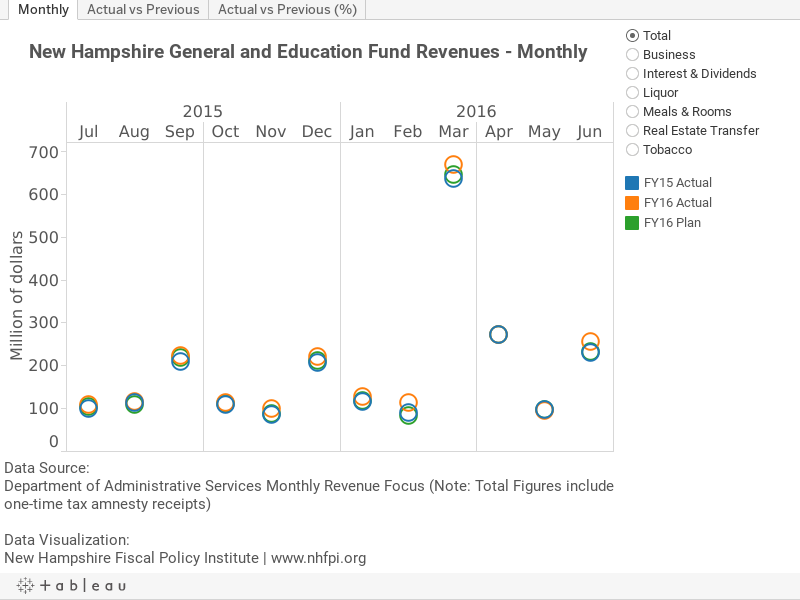 On the whole, private sector businesses in New Hampshire are doing quite well. Through the first six months of FY 2016, business profits and business enterprise taxes collectively have yielded approximately $270 million. This accumulation represents a 15 percent increase from what these two major revenue streams generated in the first six months of last fiscal year. This appears to signal that private companies doing business in New Hampshire are in good shape. Labor market data corroborate this, as the rate at which private employers are expanding payrolls has accelerated and is growing at its fastest pace in a decade. According to the Quarterly Census of Employment and Wages, private employers added, on net, over 8,000 jobs between June 2014 and June 2015. Employers adding extra workers translates into more workers receiving paychecks, which means more disposable income for households in the aggregate to spend. This added income for Granite Staters, as well as for residents of our neighboring states — who contribute to consumer demand in New Hampshire — is likely the driving force behind the positive performance of the meals and rooms tax to date. According to the Department of Administrative Services’ Monthly Revenue Focus, the meals and rooms tax grew by 4.4 percent in FY 2013, 5.3 percent in FY 2014, and 7.3 percent in FY 2015. Thus far in FY 2016, meals and rooms tax collections have grown by 7.2 percent, ahead of the Committee of Conference’s anticipation of 5 percent growth. While FY 2016 looks good overall, there is some concern regarding the breadth of revenue growth. As of the end of December, the state’s General and Education Funds were ahead of the first six months of FY 2015 by about $56 million (excluding one-time tax amnesty receipts). While this is welcome news, digging deeper reveals that only three of New Hampshire’s nearly twenty revenue streams are carrying their weight. Collectively, business taxes ($36 million), the meals and rooms tax ($11 million), and the real estate transfer tax ($8 million) account for virtually all of the growth in FY 2016 revenues. Yet, these three comprise only about 40 percent to 45 percent of total state General and Education Fund revenues. Admittedly, it is early to be too concerned since the bulk of some taxes are received in the second part of the fiscal year. Nevertheless, taken together, tobacco tax revenue and transfers from the Liquor and Lottery have grown by only $4 million. This is troubling, since in a given fiscal year they comprise nearly one-fifth of all revenues. Additionally, the statewide property tax, which is about 15 percent of total revenues, can’t grow by statute, but is rather a flat dollar amount every year ($363 million). Finally, the Communication Services Tax (CST) continues to fade as a significant source of revenue. For context, the tax collected around $80 million in FY 2012 before the legislature passed a bill to exempt the fees customers pay for Internet access from taxation. Subsequently, the CST yielded only $60 million in FY 2013, $59 million in FY 2014, and $58 million in FY 2015, with collections for FY 2016 trending even lower.